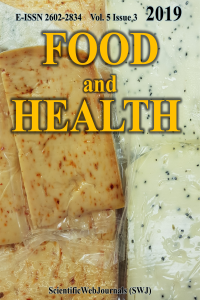 “Food and Health” journal will publish peer-reviewed (double blind) articles covering all aspects of food science and their health effect in the form of research, short communication, and review articles.. Their team of experts provides editorial excellence, fast publication processes and high visibility for your paper. Our journal will be published quarterly in English or Turkish language. All expenses of the journal are covered by the ScientificWebJournals. Processing and publication are free of charge with the journal. There is no article processing charges or submission fees for any submitted or accepted articles. Ethic Rules and Plagiarism Journal Copyright Policy Publisher "ScientificWebJournals"
Aim & Scope Author Guidelines Archive Editorial Board Contact Ethic Rules and Plagiarism Journal Copyright Policy Publisher "ScientificWebJournals"